The Wilton native grew up in Ridgefield. and graduated from the high school in 1925. After two years of nursing school, Hoyt joined the DNA, now the Ridgefield Visiting Nurse Association. During her 45-year career, she ministered to literally thousands of Ridgefielders. She was called Ridgefield’s “Florence Nightingale on Wheels,” and for decades her name was synonymous with the District Nursing Association — and a helping hand. ● She handled 933 cases. Those cases entailed 4,823 visits. ● At the same time, she provided health checks, including weighing and measuring, for 1,182 school children. ● She did 1,139 vision and hearing tests for students. ● She assisted the school physician with 596 physical exams of students. During that time, the DNA was governed by seven volunteer officers including a first vice president and a second vice president, and 19 volunteer members of a board of directors. 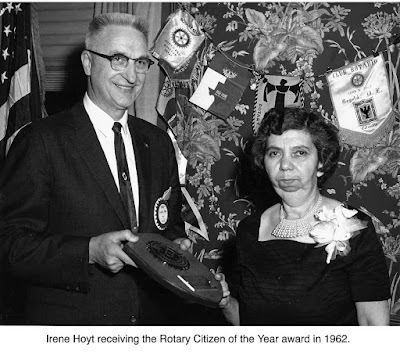 All, to see that Irene Hoyt and her patients got the support they needed. Today there are more than 100 paid staff members of the Ridgefield Visiting Nurse Association, the modern version of the DNA. Instead of a one-room office on Catoonah Street, the RVNA has a multimillion dollar headquarters which just opened on Governor Street. The building Hoyt worked in “looked so run down inside” that Ward once paid to have the association headquarters completely renovated. Her devotion to the welfare of Ridgefielders led to her being named Rotary Citizen of the Year in 1962. 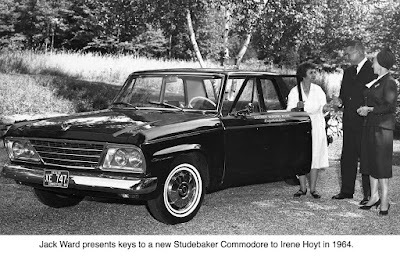 It was in her office, doing the work she loved so much, that Miss Hoyt died suddenly one Sunday in 1972 at the age of 63. “She devoted her talents to helping people who were in trouble – physical, mental or emotional – and her success can be gauged by the number of people who will miss her gentle ministrations,” Linette Burton wrote.